Paul The Deacon (720-797?) wrote historical and other works which were widely read in the Middle Ages. Extending Eutropius's 4th-century Roman history, he created an updated version, to the time of the emperor Justinian (died 565). 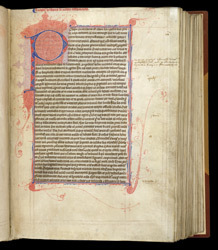 This manuscript is one of only three--all now in the British Library--which are known to have survived from the library of the Carmelite convent at Lincoln. The exceptionally fine penwork of this initial 'P' includes a number of tiny male and female heads in profile. This is from a history of the Old Testament.